As one of the editors of and contributors to "Star Wars and History", I use Star Wars to inspire students to seek parallels or contrasts between history and popular culture, encouraging them to assess and engage with the past in creative, energizing manners. The epic stories of Star Wars seem far, far away, but they are actually based on events a lot closer to home. The Death Star is capable of destroying entire planets, but here on earth we've created and used our own weapons of mass destruction. Palpatine rose from a humble background on Naboo to become the leader of the first Galactic Empire, a story reminiscent of some of history's greatest tyrants. 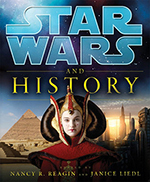 In their new book, Star Wars and History, editors Nancy Reagin and Janice Liedl explore these ideas and more. This unique and exciting book was written using the notes of Star Wars creator, George Lucas and the historical concepts that inspired his stories. Star Wars and History Official Page Order Your Copy!